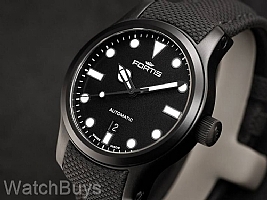 Already known for their Marinemaster and Diver watches, Fortis is proud to announce a new addition to the Aquatic line: the Shoreliner Collection. The Shoreliner name was inspired by a watch design that would work equally well at the beach, pool or board room. Clean, straightforward designs highlight the Shoreliner watches, you'll notice an absence of numerals around the dial. The round, white indices found around the dial are the inspiration for the Lighthouse name, as they invoke the circular and cylindrical nature of lighthouses. All indices on the Shoreliner Lighthouse are applied and raised, and have a blue night glow, as do both the hour and minute hands. The date display is at the 6 position and is the only numeral found on the dial. This watch is fitted with a black Fortis Performance strap which integrates into the case lug with no gaps.